Wrestling has long been considered the fundamental element of mixed martial arts. Wrestling is a combat sport involving grappling type techniques such as clinch fighting, throws and takedowns, joint locks, pins and other grappling holds. Mixed martial arts has seen a surge in popularity over the past decade and in the last few years women’s mixed martial arts has also seen significant spikes. While Ronda Rousey may be the most commonly associated name there are many others before her who helped pave the way. Many of those early pioneers of women’s mixed martial arts got into the sport of MMA through wrestling. One such woman is current Invicta Fighting Championship’s bantamweight champion Tonya Evinger. Evinger wrestled in junior high, high school, college, and on the national team at the Olympic training center. Her tenure in wrestling spanned from 1994 to 2004, before transitioning to MMA. If you have ever watched a Tonya Evinger fight you know that her takedown game is strong, and once she gets her opponent to the canvas there is a significant chance of them either being grounded and pounded out or submitted. While I was in school there were no females on our wrestling team, and I’m not sure many of the boys would have accepted it at the time if there were. Could you imagine the bullying that would take place had a boy been pinned by a girl? Things seemed to have changed over the years and girls participating and competing in wrestling seems to have become the norm. “One of the things that we’ve noticed when looking at the numbers is that girls wrestling at the elementary age and even somewhat the middle school age have been going up, and you’re seeing more girls wrestling in high school but not a whole lot,” Ernie Derrera, Frederick, Colorado athletic director and wrestling committee chair said this week in an interview with Broomfield Enterprise. The Frederick High School will host a girls-only wrestling tournament on January 14. According to the National Wrestling Coaches Association, several states throughout the country already have girls wrestling sanctioned, including Texas (the first state to do so), California, Oregon, Washington and Hawaii. “We know there are a lot of girls wrestling, but we want to set up some pilot tournaments to see just what kind of numbers we do have and are they as high as we believe they are. Are there girls that want to wrestle just against female competition? For many reasons, we think we’re missing out on some girls that want to wrestle but just aren’t,” Derrera said. 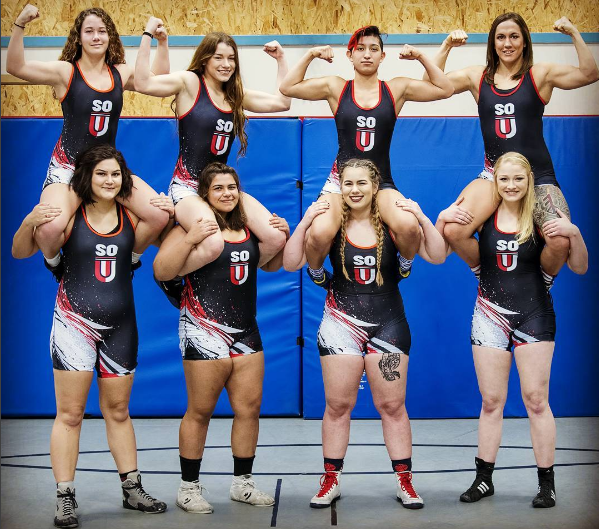 Kalyn Schwartz (top right), another Invicta FC competitor is wrestling for Southern Oregon University. Intermediate School in Pennylvania. She has been participating in the sport for four years. “I come from a family of wrestlers so it’s in my blood. I do it to prove to myself and the boys that I’m just as strong if not stronger than them,” Kutzler said. She comes from a family of wrestlers. Father, Kevin, his brothers, and her mother (Jessica)’s brother all wrestled. Jessica’s second cousin is two time Olympic alternate wrestler Tommy Rowlands. Following graduation from Ohio State in 2004, Rowlands had a successful international wrestling career. From 2004-2012, he was a University World Champion, Pan-Am Champion, 2x U.S. Open Champion, and 6x U.S. National Team Member. Rowlands was narrowly defeated in the finals of the Olympic Trials in 2008 and 2012 and became one of the few 2x Olympic Alternates in American wrestling history. He retired from competition following the 2012 Olympic Trials. “My goal is for them (boys) to accept me as a wrestler not just a girl that wrestles. Also to get other girls the confidence to join wrestling too. I’m going to continue wrestling and hopefully get a college scholarship through wrestling,” she said. Not every boy or girl that wrestles is going to continue on with the sport later in life. In any sport, as athletes get older the participation levels decrease. Competition becomes greater and chances of making it to the professional level decrease. Let’s face it, life happens. Unless you are able to seek financial gain from your talent, the sport fizzles to just a hobby. Like Tonya Evinger however, there are women who keep moving forward and progress. Not all female wrestlers are transitioning to mixed martial arts, but many have. Some are achieving big things, fighting on and competing at the highest levels in the UFC. Take former champion Miesha Tate, or former title challenger Sara McMann for example. McMann is the first American woman in history to receive a silver medal in Olympic wrestling, which she won at the 2004 Summer Olympics in Athens, Greece. She wrestled in the Women’s Freestyle 63 kg or 138.75 lb weight class. McMann won silver medal in the 2003 world championships and a bronze medal in the 2005 and 2007 world championships. She started wrestling at the age of 14 in Marion, North Carolina at McDowell High School. After transition to mixed martial arts she was undefeated before challenging Ronda Rousey for the title. Olympic wrestlers Helen Maroulis and Adeline Gray would also likely find success with their strong wrestling backgrounds should they consider a transition to MMA, and as fans, we should hope they do make that move because it would be entertaining to watch and would solidify the acknowledgement of wrestling as a fundamental for MMA. If you are a young woman sitting on the fence, wondering if wrestling is right for you, give it a shot. You never know where it may take you. You may start out wrestling the boys at your junior high. You may end up in the Olympic games. You may even challenge one day for a UFC title. But you won’t know until you try.